Timberlake is a true dancer, and his dancers are extensions of his signature style. The crew has become a kind of family: You'll see the same core group of dancers alongside Timberlake at all his performances. (Fun fact: Timberlake was the first major recording artist to protect his dancers under a SAG-AFTRA touring agreement, a major stepping stone toward improving the working conditions of professional dancers.) "The respect for his camp is remarkable," says Bellissimo of Timberlake. The leader of that camp is Marty Kudelka, head choreographer for Timberlake, who has a close working relationship with Bellissimo. "I didn't audition for the Super Bowl, but I did audition for Justin's 'Filthy' video," Bellissimo says. "I had to freestyle for Marty after hearing the song for the first time, although it didn't take long to fall in love with the layered waves of music in that track." 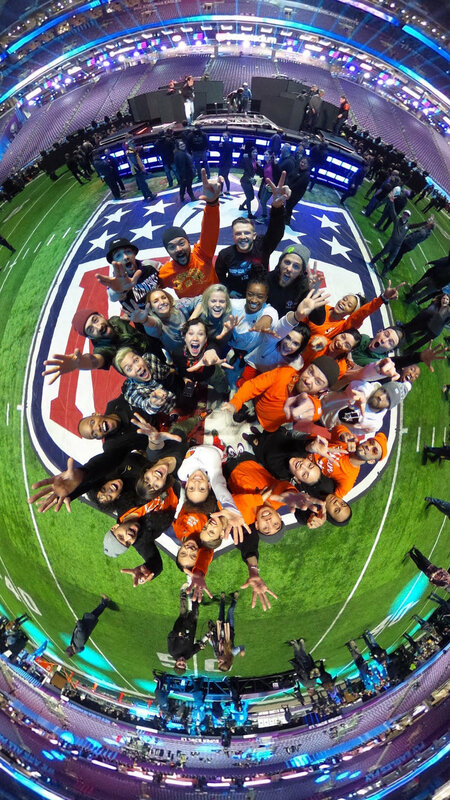 Being part of Timberlake's pack and working with Kudelka on previous projects helped Bellissimo secure a spot on the biggest stage (ahem, field) in the nation. 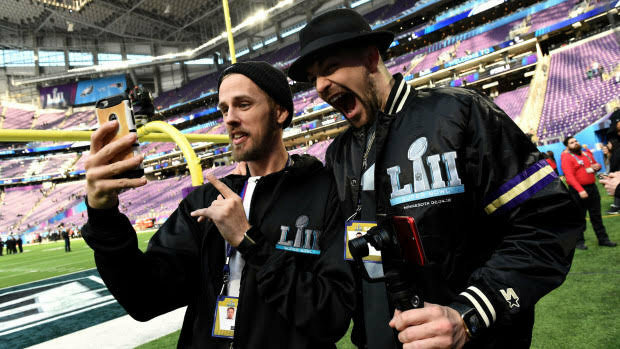 The Super Bowl LII dancers worked every day for nearly three weeks to prepare for the halftime performance. Bellissimo compares Timberlake's work ethic to that of Michael Jackson, who was famously engaged in rehearsals. "Justin came into rehearsal and put in the work with us. He'd be in the mirror working to get what was already amazing to be outstanding," says Bellissimo. "He'd chime in on certain moves or musical accents that work for him." You can imagine how the dancers felt moments before "Filthy" blared through the U.S. Bank Stadium in Minneapolis. "Right before we walked on the field, JT gave the most amazing speech to motivate the dancers and the band," Bellissimo says. "We all yelled and screamed. I could've run through a wall, I was so hype!" The key to surviving the routine's demanding choreography, Bellissimo says, was to channel that energy. He was required to run constantly from stage to stage, with countless cameras following the action. And then there was the knowledge that hundreds of millions of viewers were following his every step. "The Super Bowl brings an added pressure, because it's a different crowd that you'd get at an award show or go to a concert," says Bellissimo. "Most people are tuned in because they're watching the game. You have to give them what they didn't know they wanted." Bellissimo is clearly a huge fan of Timberlake. (He admits that the first time he saw Timberlake, practicing with Kudelka on the set of "Suit and Tie," he blurted out, "THERE'S JUSTIN!" To which Timberlake replied, "HERE I AM!") Still, when you're dancing alongside your idol, it's best to not lose your cool. When working with celebrities and role models, Bellissimo's advice is to remain professional. "I've heard stories about dancers saying the wrong thing, getting too hands-on, or overstepping their position," Bellissimo says. "That will get you fired, replaced, and shipped out before you can tie your shoes! Remember that it's a job, so if you want to keep it, find the right time to have fun in between the work."